Last week Travis was gone late one night for work, but I had a plan: stove-top popcorn and the new Veggie Tales Noah's Ark movie. My kids enjoy Veggie Tales and so when I was offered the opportunity to review the latest dvd I jumped at the chance. I knew they would enjoy it and I knew it would be a great movie that they would want to watch again and again. I was right. The kids giggled and swayed and smiled through the movie, and have asked to watch it again since. The best part, though, is that with my review copy came a giveaway copy and two plush toys for one lucky reader to win. These babies will make great Easter basket stuffers and I'm incredibly happy to make your life a little easier and save you a bit of money and send you these top notch gifts. Want to win? 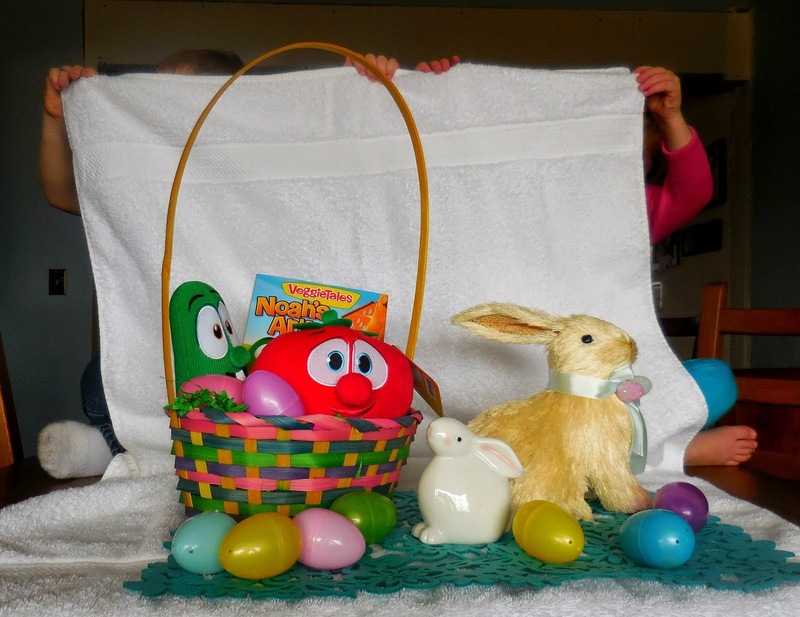 To enter all you have to do is leave a comment telling me whose Easter basket you'll be putting the Noah's Ark dvd and plush Larry the Cucumber and Bob the Tomato toys. Please make sure you leave your email address is your commenting name is not already linked to one, otherwise you'll be disqualified. CONGRATS TO MAUREEN ADAMCIK! YOU WON! I'd love to win! This DVD and toys would go to my 5 year old son. Thanks!! We do one big family Easter (laundry) basket so everyone could enjoy this! My 3 year old loves veggietales! What a great giveaway! I hope you and your family have a blessed Easter! My 4 yr. old would love this, big Veggie Tales fan. Thanks for the giveaway! I would make it a family Easter basket. My oldest is five and loves Veggie Tales, so the movie would mostly be for him, and my two youngest are newborn twins who probably wont get much out of the movie or the plush toys, yet, but we could give them each a plush toy anyway, right? My five year old just recently started liking Veggie Tales and it has been a lifesaver to know there is something he enjoys that he can stream on Netflix and I can know it is quality programming, unlike many other "kids" shows that we have been struggling with lately. I am Amanda, BTW- not sure how it comes across when I comment. I'd put this in my 1 year old's basket. My kids all love Veggie Tales! Hmm... With four little girls, they might get split between the baskets. Or girl #3, my sweet Clare, might just reap the benefits and get them all! I'd probably put this in my two year old's stash–but I know her sister would love it too! If i win everything will be going in my son Blaise's basket. He loves Veggie Tales! My kids love Veggie Tales -- E is starting to get some of the more subtle jokes, and M and Q love it all. I'd probably put the DVD in E's basket, with a plush in M and Q's baskets. This will go to my two year old daughter. 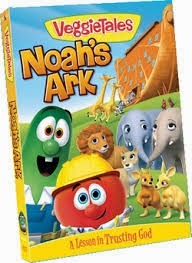 She loves the veggie tales Jonah and the Whale, so she's sure to enjoy this one! This would go in my daughter's basket! She loves the story of the animals in Noah's ark so this would be right up her alley! Our 4 year old son would love this! Both of my kids would love it! I would place this in a basket for both of my boys...Isaac 6 and Landon 3. We are VeggieTales house for sure but we don't have that one! I'd put the DVD in Rose's basket and the plush toys in Poppy's basket! Thanks for your review! The 4.5 year old twins would each get a plush toy and the baby would get the movie :) The older boys always watch what the baby is watching anyway! They would be for my Lucia. She likes VeggieTales and her favorite food is tomatoes so Bob is a favorite character here. Both of my girls would love, not sure how to pick who's basket to put it in! Likely Liam's both perhaps Caitlin's if her basket is the lightest. Oh, we love Larry and Bob here! Our boys would enjoy the toys and the movie! Love, love the photo of the kids holding the bath towel. Definitely Teddy because he already watches too much VTs on Amazon prime! Movie for my 6 year old and stuffies for my two year old! What a fun giveaway! My one and only would love this! And then maybe she'll share with her little sister who may or may not make her arrival by Easter. My 9 month old would think these are so fun! My older boys would love the movie! We've watched Veggietales since their beginning, so I would have to put the video in the family basket (the teenagers would watch it on school break I bet!) and the plush toys would go into the toddlers' baskets (but would probably be promptly borrowed by the 4 yr and 6 yr old who love stuffed animals). I'd give this to my grandchildren! this is so cute! my 19 month old is hitting prime age for Easter baskets, and she would love it! Definitely going in my son's, Joseph, Easter basket. Happy Feast of St. Joseph!! These would definitely go in my daughter's basket. She loves Bob! This would be so cute for my 1 year old son's Easter basket! We can't wait to get him into Veggie Tales! My two year old, Joshua, is the biggest Veggie Tales fan in our house. All the kids would enjoy the DVD but Bob and Larry would be for Josh! Thanks for the giveaway Bonnie! Oh my 3yr old daughter would love this! Thanks for the giveaway! Yay! We love Veggie Tales. I'd put one of each of the three things into each of my three girls' baskets. Thanks for doing the giveaway! I'd love to win, I love Veggie Tales!! i have 10, 5, and 3 years old, and a 3 month baby. they would all love this. we love veggietales all the way! we even have a "Veggietales Station" in our Pandora music account! haha! PS love the new picture of you, Bonnie! This would be for my 3 year old son! This would go to my son Dominic :)! Veggie tales is a family fave! I would be splitting it up among my 3 little rascals baskets. I have four boys, but it would have to go to the baby Will!